Komen Houston is partnering with Houston’s bike share program–Houston BCycle–to offer a special donation option that promotes healthy and fun travel throughout the city. Pedal for the Cure gives donors the opportunity to not only contribute to Komen Houston’s local fight against breast cancer, but also, take preventative health measures and practice an active lifestyle by choosing BCycle as a way to get around our city. How can you participate? Donate $20 to Komen Houston today and in return, you’ll receive a gift certificate for a Monthly Membership to Houston BCycle. 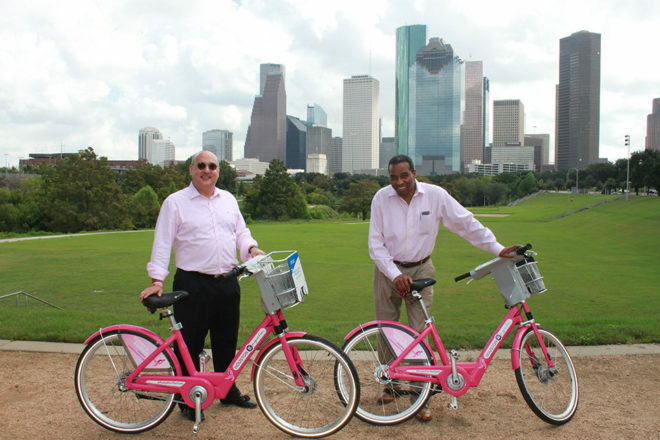 Additionally, you will see two new pink Komen bikes in the Houston BCycle system. When you check out a pink bike, if you take a picture and post using #PedalForTheCure on social media, you can be eligible to win more free membership time! Learn more about how to use bike share by visiting the Houston BCycle website.